Does your spouse think you're selfish? 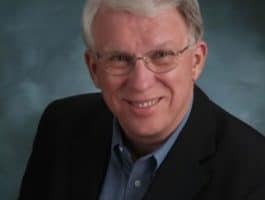 Best-selling author Dr. Larry Crabb focuses on the number #1 enemy of marriage - selfishness. Crabb explains that in order to love our spouse well, we must die to ourselves and our own needs and wants, and focus on the needs of our spouse. Bob: This is FamilyLife Today for Monday, February 17th. Our host is the President of FamilyLife®, Dennis Rainey, and I’m Bob Lepine. There are significant differences between men and women; but when it comes to being self-centered, we’re all in the same boat. Stay tuned. And welcome to FamilyLife Today. Thanks for joining us. You know, it was—I guess, almost two decades ago, now—you wrote a book. It was a book called One Home at a Time. Bob: I was having a hard time there for a minute—One Home at a Time. You talked about four core messages that you felt like needed to be resolved for homes and families to be pointed in the right direction. Bob: I remember what they were. You talked about the need for personal repentance and purity. Bob: People need to be right with God. Bob: You talked about the need for an understanding of the marriage covenant. Bob: You talked about the need for husbands and wives to understand their unique assignment—their unique responsibilities in marriage. Dennis: He has demonstrated those as a part of his life, his teaching, speaking, and writing. It’s good to have Dr. Larry Crabb with us on FamilyLife Today. Larry—welcome back to the broadcast. Larry: It’s great to be with you guys. Dennis: I say welcome back. How many years ago was it, Bob? Bob: It’s been 15/16/17 years ago. Larry: I feel so affirmed. Dennis: Well, Larry and his wife, Rachel, live on the front range of Colorado. They have two adult sons who are married—five grandchildren. He is a psychologist, a conference speaker, Bible teacher. A lot of people have been to the well and have drunk deeply out of your writings. We’re grateful that you joined us, here on the broadcast. Bob: Well, and I found this interesting because—23 books that you’ve written—you wrote one back in 1991. Just recently, that book has been republished. Why this book—from 20-plus years ago—that all of a sudden is resurfacing in this era? Bob: I think the culture could stand to dig into this; don’t you? Dennis: Well, the title of the book is Men and Women: Enjoying the Difference; and there is a difference. Some folks may differ with us on that; but by the time we are done, I think they are going to hear a good, thorough biblical case for how those differences are to complete each other and how we’re to relate to one another. Larry: The limited array—I’ll look at. Dennis: Let’s start with what your book talks about. You begin the first half of the book talking about public enemy number one in marriage—that’s our selfishness. Larry: That’s the problem. After doing a lot of marriage counseling, over a lot of years, all of my techniques proved relatively useless. All of my training, to some degree, didn’t hit the nail on the head; you know? Larry: It just became clear to me that there’s a battle going on in every human being between their flesh and their spirit—to put it in biblical terms—between my self-centeredness and my desire to love the Lord. Dennis: Oh, I’ve heard these comments before! Larry: And I’m a trained psychologist. Larry: —that only the cross of Christ deals with. Larry: You can’t find any solution to self-centeredness apart from the gospel, apart from the power of the Spirit, apart from the new heart that God gives us—all that has got to be crucial. Bob: Then, it goes on to say, “Don’t merely look out for your own interests, but also for the interests of others.” I saw that theme over and over again in the opening chapters of your book. Bob: If we can just figure out how to die to self and how to love somebody else, marriage can be glorious. Larry: I prayed him out! But we actually did have our “first date” when we were twelve years old. I, over the next teenage years—I fell in love with her and wanted to marry her; and she wanted to marry me. We stood before the preacher—I can recall—I said all the right words: “I’ll love, honor, and cherish until one of us dies.” But what I was saying, without even realizing it—Proverbs says that the purposes of a man’s heart are like deep waters. Larry: And I think I didn’t see that, at the time. It’s taken 47 years to get clearer and clearer that that energy is still within me, and only the gospel has the power to release me to love her in a way that I really want to. “Okay, yes, I get it. I’m selfish. Yes. So—next—what do you want to talk about next?” Then, there is another group, who are going, “I don’t think I’m as bad as you think I am,”—some people who minimize the reality of their selfishness and some people who kind of rush past it. One of the things you do in your book is—you won’t let us rush past it. You kind of take us deeper into the experience of the reality of our selfishness to make us confront stuff that we try to scoot past too quickly. Larry: The beginning of the gospel is bad news: “We’re in trouble.” The center of gospel is incredibly good news. Until we hear the bad news, we don’t appreciate—we can’t sing Amazing Grace with any kind of meaning. Larry: I did have one person—when they first read the book—they said, “Larry, the first half of the book you’re convincing me I’m self-centered. I got the point in the first chapter. Couldn’t you get to the good stuff?” My response is: “I don’t think that you get to the good stuff until you really embrace the bad stuff.” Look at the Bible—66 love letters. The first 39 are saying—what? “You’re in trouble.” Then, the next one starts in Matthew; but the hero has come. Once you know what your trouble is, you’re going to be so grateful for the Messiah. Dennis: You alluded to this earlier. Forty-seven years into your marriage, you are more convinced than ever of your self-centeredness. Dennis: You didn’t start out that way. Dennis: It is interesting how we, as human beings, have to go through life to really understand how marriage and children were given to us, by God, to redeem us from ourselves—to teach us the bad news that we really are selfish. We want to have it our way and how we want to do it. That’s not always going to happen in a marriage or in raising children. is our problem really isn’t self-centeredness—it’s justified self-centeredness. We really assume that, when we’re looking out for ourselves, that—given how badly we feel / what a rotten day we’ve had—whatever it might be—that, somehow, it’s warranted that I require you to come through for me in particular ways. There is no such thing as justified self-centeredness. Dennis: You’ve counseled—how many people?—several thousands, undoubtedly. Dennis: Yes, you had a guy who justified an affair over something his wife had done or hadn’t done in this case. Larry: That happens a lot. I mean, you’re talking about—his name is Legion. There are so many people that have—when they’ve done something really wrong, like have an affair, which is obviously inexcusable—but when you talk to the guy that’s had the affair, what—and there are several people I can think of when I’m thinking of this—that the response is: “You know, I know I shouldn’t have done it, but….” Then, what follows the “but” is the excuse. It’s the justification. It’s the warrant. It really comes down to: “I’m hurting so badly. “That’s exactly right,” because when we think our woundedness is the biggest problem, we can’t get the gospel help we need; can we? Dennis: What you are really talking about, Larry, is you’re calling men and women to, first, surrender to the One who defeated death on your behalf, Jesus Christ. Bob: Well, before you do that, though, you’ve got to acknowledge the reality—the deep reality of just how selfish you are; right? who defined sin so simply and profoundly when he said, “Sin is the condition of being curved in on yourself.” What a simple definition, but what a profound definition. So, in the middle of a conversation about iced tea or in the middle of some big, horrendous thing—whether it is trivial or monumental—“Am I really curved in on myself? Am I really looking out for me and expecting you to take care of me?” Until that’s understood, then, Jesus has not been seen for who He is. Dennis: And Jesus calls us to die to self. Larry: —but also, “When you have an opportunity, go look after somebody else.” Kendall said: “No, no; no. Don’t look out for your own self-interests,”—and I think the reason why is because Jesus already did! And now, that you are taken care of, you’re free to move toward somebody else without ultimate concern for yourself. Of course, you still want something for yourself; but you’re not demanding it anymore. You’re not requiring it. Your life doesn’t depend on it. Bob: Well, I’m curious because some people I’ve heard will look at Jesus—giving the Great Commandment—and He says, “Love God with all your heart, soul, mind, and strength. Love your neighbor as yourself.” They will say, “See there, the Bible teaches you—you are to love yourself.” That’s not what that verse is teaching; is it? Larry: That’s one of the greatest misunderstandings in all the texts: “I can’t love you until I love myself. So, let me go for ten years of therapy. Then, when I get myself built up in my self-esteem, then, I’ll give you a chance to be loved, as well.” That’s just not what He’s teaching. Bob: —“and I need to deal with that,” Christ has dealt with that. How do they appropriate what Christ has done for them? “I am broken. I am ruined. I’m hopeless. I’m helpless.” That sounds like terrible news. It is until you go to the next step. Basically, the response is: “Lord, is it possible that, exactly as I am right now, You actually love me? You’re for me? You want me to live a good life? You want—You have given me a new way to live?” If I start, actually, believing that, by faith, then, maybe some good things can happen. Dennis: And so, how does that person surrender to Christ and receive that gift of forgiveness that he needs or she needs? Larry: Well, that person has to turn to Jesus—as the condition they are aware of that they are now in—as very self-centered and very big trouble—and realize that: “As long as I continue to live in my self-centeredness, ‘the way might seem right, but the end there of”—to quote a verse—“are the ways of death.’ I’m heading toward absolute misery forever, and that’s not what I want.” A gift is available to me. —and this is crucial—“You’ve given me a new heart.” Ezekiel 36 talks about a new heart. He says that, in this new heart, “You’re going to be moved to keep My decree.” What I think that means is—you’re going to discover, not the obligation to be others-centered—although it is an obligation—you’re going to discover the desire to be others-centered. You’re not just—just being obedient as a grudging sort of a thing—but it’s what you want to do with your life. Dennis: It’s not a matter of cleaning up your act first before you come to Christ. It’s a matter of coming as you are. Then, let Him begin to clean up your act in you. Larry: You don’t take the bath before you come to Jesus because you can’t find the water to clean yourself with. Dennis: It’s not just misery for a lifetime of being selfish. It’s that you’re making a determinative choice on your eternal destination. That’s why Christ went to the cross—is to redeem us from the punishment and judgment of sin, and to give us a name, a family, and a home in heaven with Him some day. Larry: Everything our soul was designed to enjoy is available in Jesus. Bob: And I would think, if a listener is not fully persuaded of the reality of his or her own selfishness, they ought to get a copy of Men and Women: Enjoying the Difference. Just read the first 118 pages because Larry—of course, now, who is going to want to buy this book now; right? One hundred eighteen pages on how selfish I am—who wants to read that? Dennis: And we’ll do it. We’ll do that this week. Bob: —A Biblical Vision of Gender That Frees Men and Women to Live Beyond Stereotypes. We’ve got both of these books in our FamilyLife Today Resource Center. I think our listeners will benefit from hearing what Larry adds to this conversation about gender and sexuality. Go to FamilyLifeToday.com to get a copy of either or both of Larry Crabb’s books, Men and Women: Enjoying the Difference and Fully Alive: A Biblical Vision of Gender That Frees Men and Women to Live Beyond Stereotypes. Again, our website is FamilyLifeToday.com; or call, toll-free, at 1-800-FL-TODAY to ask about how to get a copy of either of these books. or maybe, it occurred to you, for the first time, that this is something that you want to pursue—on our website at FamilyLifeToday.com, we have a link that says, “TWO WAYS TO LIVE.” I want to encourage you to click on that link and get more information about what it means to have a relationship with God by trusting in His Son, Jesus. Again, go to FamilyLifeToday.com. Click on the link that you see there for “TWO WAYS TO LIVE”. Then, jot us a note. Let us know how God has used today’s program in your life. We’d love to hear from you. And we also want to say, “Thanks,” to those of you who make our program possible—those of you who link arms with us in the mission of providing practical, biblical help for marriages and families. You look around, as we do, and see the condition of marriages and families in our culture. You recognize there is a need for dialogue, like we’ve had today, to address the issues we’re talking about here. We appreciate your prayerful, financial support of this ministry. That’s what makes FamilyLife Today possible. In fact, your donations make up about 60 percent of what it costs us to produce and syndicate this program and operate the ministry of FamilyLife Today. We do appreciate your generosity. In fact, we’d like to say, “Thank you,” this month, for your support by sending you some CDs with a conversation we had, a while back, with Pastor Mark Driscoll and his wife Grace on the subject of marriage. It was a candid and transparent conversation. I think you’ll benefit from hearing their story and from hearing their thoughts about how husbands and wives can pursue harmony in the marriage relationship. Go to FamilyLifeToday.com to make an online donation. Click the button that says, “I CARE,” and make your donation online. We’ll send these CDs with Mark and Grace Driscoll out to you. Or call 1-800-FL-TODAY. Make a donation over the phone and be sure to ask for the CDs with the Driscolls. Or you can mail a check to FamilyLife Today and request these CDs. Our mailing address is: P O Box 7111, Little Rock, AR. Our zip code is 72223. And we hope you can be back with us again tomorrow. Larry Crabb is going to be back. We’re going to continue to talk about men, and women, and God—and differences, and marriage, and how all of that fits together. Hope you can tune in.